When told that a son of a friend was going to climb Kilimanjaro as part of a project to raise money for a children’s education programme to combat AIDS in Africa, I wanted to help. In appreciation of my own childhood, I decided to write this little account of life as I lived it in the 1940’s to early 1950’s. All profits from the book’s sale has been promised to the above cause. This new edition adds four new chapters, covering the years to 1980. Starting a home – moving to Loughborough and then up north to Furness. Starting a familiy – the trials and tribulations of the 1950’s NHS and social attitudes. Freelance designing and teacher training – becoming a student again ! The joys of teaching. 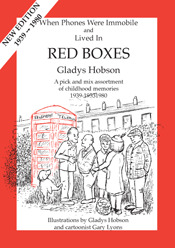 “A charming publication, well written and guaranteed to bring back fond memories for people of a certain age… those among us who always relied on the telephone in the red box as opposed to the anti social horror story that is the mobile phone. The book is highly entertaining and vastly amusing, especially the ‘balloon’ blowing incident!” — Cumbria and Lake District Life, Aug 2004. 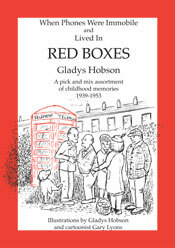 “Red Boxes is very interesting and entertaining, and it certainly brings back memories of a different way of living, which I’m sure younger people will find almost strange — used as they are to all mod–cons and lots of everything! The drawings add to the reader’s enjoyment.” — Maureen Hillman. Please note that this original version is out of print, please order the revised version above. The information below is for reference only.